During the development of higher life forms over the course of millions of years, there have always been significant and comparatively sudden leaps in development. As a consequence, living organisms developed new skills and conquered additional habitats. In this process they adopted these abilities partly from their predecessor organisms: For example the plastids of the plants, the place where photosynthesis takes place, were originally autonomous unicellular living organisms. The developmental transformation of cyanobacteria into such cell organelles—the endosymbiosis, provided the plant cell with the ability to photosynthesize and thus the ability to produce energy from sunlight. Apparently, a similarly important common characteristic of plants and higher living organisms developed in a comparable manner: An international research team from the Institute of General Microbiology at Kiel University (CAU) and from the Israeli Weizmann Institute of Science has found evidence that the redox regulation in plant metabolism has its origin in two successive plastid endosymbiosis events. The results of the work funded by the Kiel Cluster of Excellence "The Future Ocean" have recently been published by the international research team in the journal Nature Plants. The development of plastids is of fundamental importance in the evolution of plants. Seen from a global perspective, plastids also boosted the so-called primary production, and thus provided oxygen and the nutritional basis for all life on Earth. To an extent, the cell paid an evolutionary price for the newly acquired advantage of energy production through photosynthesis. It had to react to the formation of highly reactive and potentially harmful byproducts, the radicals. Interestingly, cells have evolved the ability to sense the level of free radicals and use this information to regulate their metabolic activity by a unique type of control mechanism—redox regulation. Since oxygen in particular tends to develop radical molecules, the redox regulation gained its importance with the higher availability of oxygen in Earth's past – a time period, which is associated with the fundamental developmental leap to multicellular life forms. In order to investigate the evolutionary origin of redox regulation, Dr. Christian Wöhle, research associate in the working group Genomic Microbiology at Kiel University, compared the redox regulated protein network of the diatom Phaeodactylum tricornutum to living organisms of various other phyla. 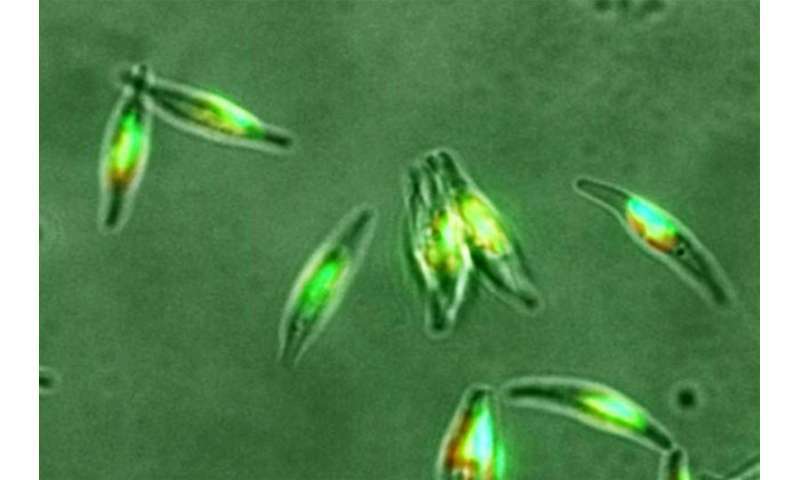 As an evolutionarily quite simple life form, the diatom already has traits of more highly developed organisms; like plants it is able to carry out photosynthesis. In this manner, this model organism allows conclusions to higher developed plant and animal life forms to be drawn. Together with their international colleagues, the researchers from Kiel recognized that the development of the redox regulation of higher living organisms coincided with the process of a multistage plastid endosymbiosis. Comparison with the protein sequences of diverse predecessor organisms has shown that a sudden increase in the occurrence of redox regulated proteins took place in the predecessors of the diatoms, at the same time as the first plastids were taken up. The redox sensitive proteins change their biochemical characteristics if they come into contact with radicals. In this manner they allow the organism to adjust its metabolism to changing environmental conditions. "We were able to observe that the proteins, which are responsible for metabolism in the development of complex plant organisms always changed when new cell organelles were added", emphasizes Wöhle, lead author of the study. The mechanism by which the diatoms acquired the ability to be redox-regulated consists in a transition of the genetic information from the subsequently acquired plastids into the genome of the receptive organism. The scientists found out that more than half of the genes involved in the redox regulation originate from unicellular organisms, in this case cyanobacteria. This observation supports the theory of the research team that the cell's ability to conduct redox regulation developed through endosymbiotic gene transfer and thus laid the foundation for the development of higher plants. "Our results allow insight into the evolutionary adaptation of life to photosynthetic energy production and the resulting required expanded regulation mechanisms of the plant cell. They help us to better understand the reaction of different organisms to a long-term change in their living conditions," summarizes co-author Professor Tal Dagan, head of the working group Genomic Microbiology at Kiel University and member of the "Kiel Evolution Center" (KEC).